They’re such a staple of everyday life that it’s hard to imagine they weren’t always around. We trace the iconic product's backstory—including a trip to the moon! 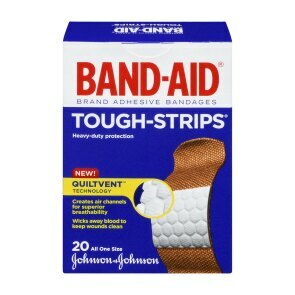 Baseball, apple pie, BAND-AID® Brand adhesive bandages. There's no doubt about it: They’re an indelible part of our culture. 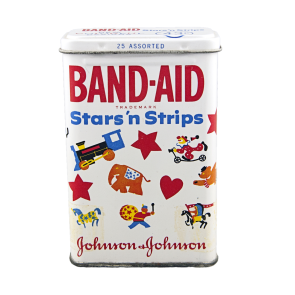 Most of us grew up using them—whether it was to patch up a scraped knee or tend to a paper cut—and you can probably still picture those iconic tins sitting in your family's medicine cabinet. 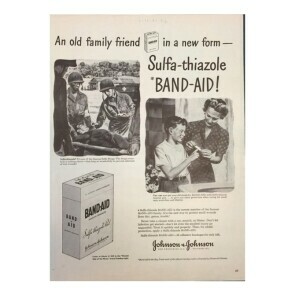 “The BAND-AID® Brand adhesive bandage was a very simple innovation, but it filled a great unmet need in consumer care,” says Margaret Gurowitz Margaret GurowitzChief Historian, Johnson & Johnson, Chief Historian at Johnson & Johnson. 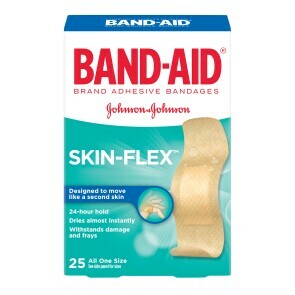 And ever since their invention 97 years ago, Johnson & Johnson Consumer Inc. has remained a pioneer in the field, consistently innovating improvements to the product—like the new BAND-AID® Brand Skin-Flex™ adhesive bandages that stay on for 24 hours, and are made with touch screen-friendly material. Here’s a look at some of the most memorable moments from the product’s history that helped make the company a global leader when it comes to taking care of all sorts of boo-boos. 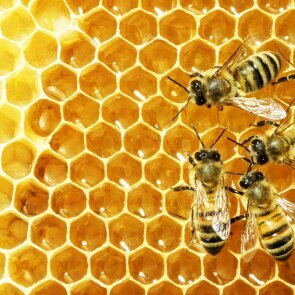 To help prevent infections, honey was placed on cuts to serve as an antibiotic barrier. After irrigating the affected area, he then wrapped the wound with fig leaves to prevent future injury or infection. 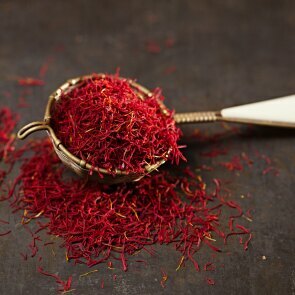 Spices with antiseptic qualities that were used included saffron, thyme and mint. But these advances fell out of favor following the fall of the Roman Empire in the late fourth century, when many innovations were lost to the Dark Ages. 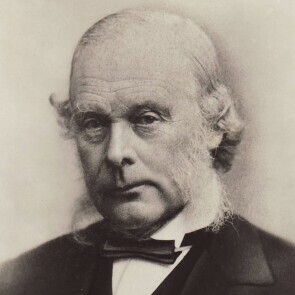 Physician Joseph Lister began treating his surgical gauze with carbolic acid, or phenol, a disinfectant. He reportedly got the idea from observing the use of carbolic acid to treat sewage stench. 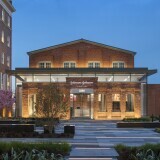 Robert Wood Johnson joined forces with his brothers James Wood Johnson and Edward Mead Johnson to create Johnson & Johnson in 1886. 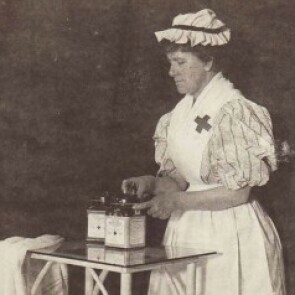 Inspired by Lister, some of the first products they sold were mass-produced sterile dressings and gauze—precursors to the modern BAND-AID® Brand adhesive bandage. The kits—packed with sterile gauze, bandages and dressings—were originally designed to help injured railroad workers, but they were soon sold to the general public. "Dickson was newly married, and his wife Josephine was prone to slicing her fingers in the kitchen,” explains Gurowitz. 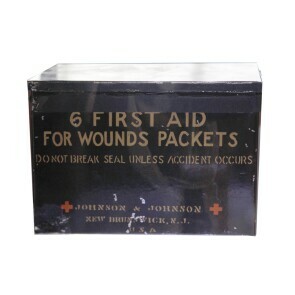 Dickson wanted a bandage his wife could easily apply herself, so he took two of the company’s early products—adhesive tape and gauze—and combined them by laying out a long piece of surgical tape, and then placing a strip of gauze down the middle. To keep the adhesive from sticking, he covered it with crinoline fabric. His wife could then dress her own wounds by cutting a piece of the tape and gauze pad, and fashioning it into a bandage. 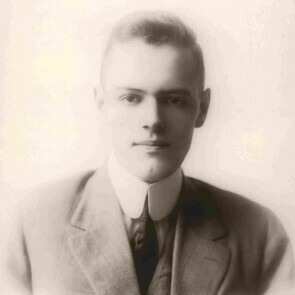 Dickson demonstrated the invention to his boss, who told company president James Wood Johnson, and a new product was born. 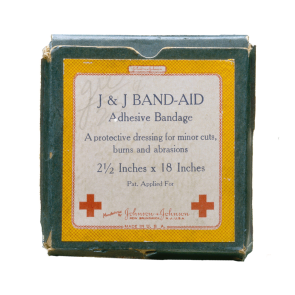 The first BAND-AID® Brand adhesive bandages were made by hand, measuring 3 inches wide and 18 inches long. “They weren’t a big hit at first—only $3,000 worth were sold the first year—because people weren’t sure how to use them,” Gurowitz says. 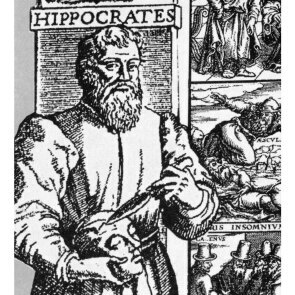 But sales increased after the company hired traveling salesmen to demonstrate the newfangled product to doctors, butchers and retail pharmacists. These machines mass-produced BAND-AID® Brand adhesive bandages that were just 3 inches long and three-quarters of an inch wide—and didn’t require scissors to cut them. 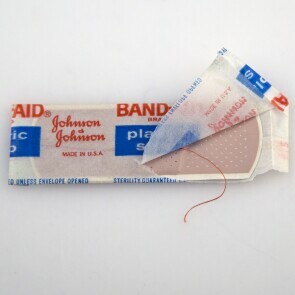 Around the same time, the little red string used to open the BAND-AID® Brand adhesive bandage wrapper was introduced, making the product much easier to open. The decorated tins were an upgrade to the cardboard boxes that had been used until that point. “And once the tin was empty, people reused it in different ways: storing small nails, holding extra buttons and safety pins, even organizing marbles and baseball cards,” Gurowitz says, adding that one of the most famous tins, from the early 1960s, featured an illustration of a woman in a sweater and pearls. 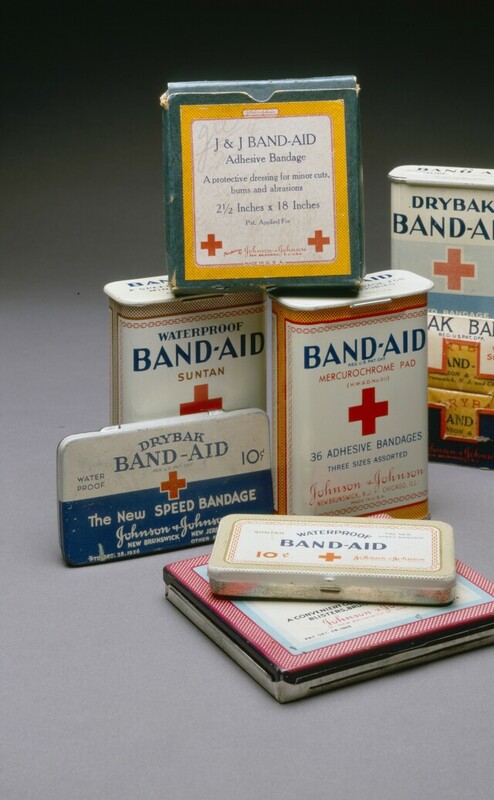 During World War II, millions of BAND-AID® Brand adhesive bandages were shipped overseas to the front lines, including packaged in soldiers’ first aid kits. The story is about a little boy who scratches his finger while playing. 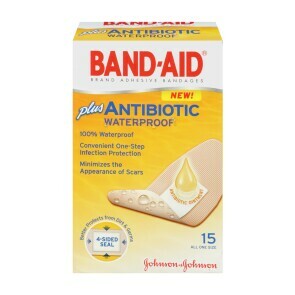 He runs to his mom, who washes it clean and bandages his finger good as new with a BAND-AID® Brand adhesive bandage. For the rest of the book, every time a friend, family member, pet or favorite toy gets a boo-boo, Dan puts a bandage on it to make it better. 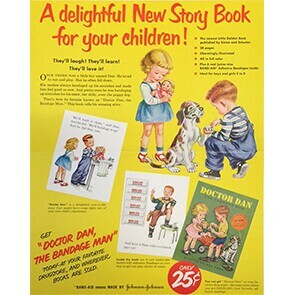 Doctor Dan’s first printing of 1.75 million copies is the largest first printing of any Little Golden Book to date. 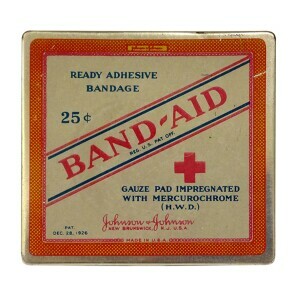 They were the first mass-marketed, decorated BAND-AID® Brand adhesive bandages—and became an instant hit. BAND-AID® Brand adhesive bandages were part of the medical kit that orbited the moon during the Apollo 8 mission. 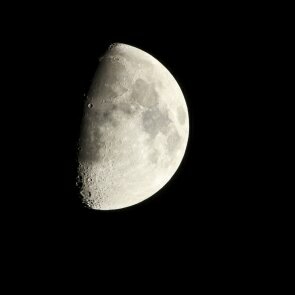 One year later, they were part of the Apollo 11 mission, which landed the first man on the moon. They were the first-ever adhesive bandage to feature specially formulated antibiotic ointment right on the pad to help prevent infection and protect from dirt and germs. The cutting-edge liquid bandage contained a proprietary mix of chemicals that formed a layer of molecules that bound to skin, keeping dirt and germs out, and moisture in. As a result, the wound healed faster than if left uncovered. 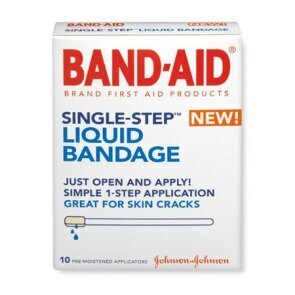 Johnson & Johnson Consumer Inc. unveiled its new BAND-AID® Brand adhesive bandage with Quiltvent™ Technology. “The padding is literally quilted, which helps wick blood away from the wound, creating air channels that protect the wound, while still letting it breathe,” explains Melinda CettinaMelinda CettinaGlobal Director R&D for BAND-AID/ COMPEED Brands & First Aid/ Medical Device Governance, Director of Global Wound Care Research & Development at Johnson & Johnson. Designed to move like a second skin, these bandages provide 24-hour hold, last through hand washes, dry almost immediately, and are made with touch screen-friendly material. “The idea behind Skin-Flex™ is that your bandage should be as transparent to your life as possible—you should be able to get back to your daily activities without feeling like you have an injury,” Cettina says.